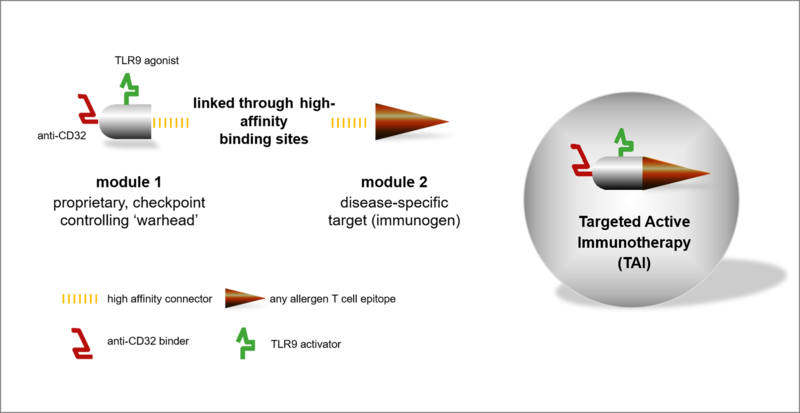 Binding to pDCs through specific interaction with FcgammaRII (CD32), which facilitates enhanced and specific uptake of the vaccine by the relevant professional antigen presenting cells (APCs). pDCs are a rare subset of circulating dendritic cells which can be found in blood and in peripheral lymphoid organs and which express both CD32 and TLR9. Triggering of pDCs to produce large amounts of Th1-inducing cytokines through a specific interaction with the Toll Like Receptor 9 (TLR9), which therefore serves as intrinsic “adjuvant”. High-affinity binding to the immunogen through a specifically designed dimerization motive that connects with its counterpart in module 2. Stimulation of allergen-specific Th1 cells through the presence of “shuffled” allergen epitopes. The epitopes are shuffled to prevent interaction with allergen-specific IgE, which may otherwise lead to the induction of an anaphylactic shock. S-TARget’s first product, SG100, will contain T cell epitopes from HDM (house dust mite), which are the major cause of allergy in the Western world.